I think Tarica would be pleased that I am typing this and that you are reading this. I don't need to say a lot here. The powerful thing for us to do is evident. Tarica and her mother Gracie took the time to go online and sign this petition in behalf of another woman in uniform who was the victim of an obviously brutal and tragic death - LaVena Johnson. Six days later it was Tarica being brutally murdered - not in Iraq, but her own yard. We signed the "Justice for LaVena Johnson" petition! 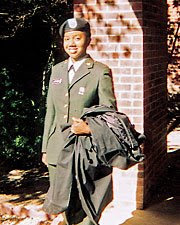 Ms. LaVena Johnson, following her family's military tradition, joined the Army immediately after finishing high school as an honor roll student. In July 2005, Ms. Johnson was found dead in a military army base in Iraq. The military ruled her death as a suicide. There was evidence found on her body however of a physical struggle consisting of two loose front teeth and a bruised lip which had to be corrected at the funeral home. Despite her father, Dr. John Johnson's inquires into her body's physical condition, the army responded that the case was closed. More evidence that did not support the military's ruling of Ms. Johnson's death was a suicide was revealed by a local Missouri news network. Ms. Johnson's mental state was quite stable according to reports before her death, there was a trail of blood leading to the barracks where her body was found as well as evidence that a perpetrator attempted to set her body on fire. Despite years of Mr. John Johnson's dedicated efforts to have the army reopen the case, they continue to refuse. Philip Barron, an independent activist, dedicated his effort toward military justice and full disclosure with the website http://www.lavenajohnson.com/ and also started a petition that has recently expired which targeted the Armed Services Committees of the Senate and the House. There is a renewed interest surrounding the call for justice for LaVena Johnson with more and more people becoming educated of the facts. Let us utilize this renewed interest and demand our Congress to call for investigations, and full disclosure of the events surrounding the death of such a beautiful soul. 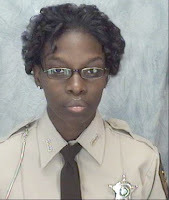 Reading the article about LaVena Johnson make me more angry after the disturbing news of my cousin Tarica Pulliam. I don't know why men feel the reason to abuse women and their children. Any man that hit a female is a complete chump. Too afraid to hit another man because they know the out come. Congress has to step in and change the laws for such type offenders. Why waste time for a restrainer when the man can still walk the earth and harm you. Stop patting these type offenders on the hand. Do something. My heart go out to the Johnson family. All victims who have been abused and killed my sympathy to all families. We must pray and ask God to give us strength doing these times of need.